Downside Up contains step-by-step guides, resources, and inter-active pages necessary to restore lost identity and transform dreams into reality. Downside Up offers wisdom, guidance, and personal application while also outlining and establishing key biblical principles that promote emotional and mental wellness. we've all experienced it at one time or another, rejection. whether it be from a spouse, a friend or even a parent. rejection is never easy, ever. and i would have never imagined something positive could come out of rejection until i read this book. 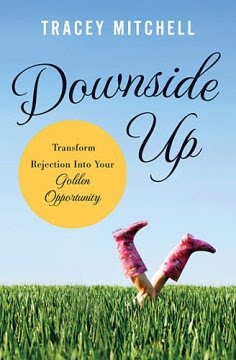 downside up shows us that there is a positive effect of getting rejected. the problem is it's hard for us to see it because our heart is so hurt. God has a plan for our life. and if there is someone i would love to plan my life, it's certainly Him. one thing that i realized throughout reading this book was there was a REASON for the rejection that you receive. it’s because that person or thing wasn't right for your life at this point in time. the end of every chapter in this book offers a list of principles gleaned from the chapter, a verse from the Bible, a quote and a plan of action that offers something for the reader to do to help them grow or heal from rejection. i really liked this way of ending each chapter. one section of this book that i especially found helpful was on negative self-talk. that is something i've always had a problem with. YOU are the person you spend the most time with. as she said "a million compliments cannot cure negative self-talk". the way we talk to our self can create a paralyzing, irrational fear of rejection within us.